besides the block party quilting bee, I also joined the cottage quilting bee. i have really enjoyed these bees...getting fabric in the mail, working on one or two blocks at a time, enjoying the great fabrics, and trying new things. 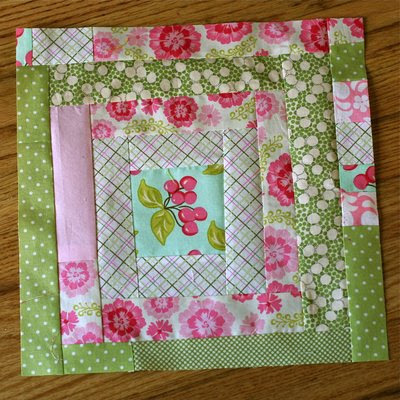 2 blocks for darci (who is hosting a fat quarter swap. fun, you should join in!). She wanted scrappy or wonky log cabins (my favorite). for those who have asked about a pattern for my boxed in quilt, there really isn't one. check out this wonky log cabin tutorial, which is basically what I did. I did a lot of finger pressing and NO measuring on that quilt. My finished (cut) squares measured 10.5 inches. I love your blocks. They came out great. Thanks! I love these block, as I have said before. Log cabins are my FAV too. 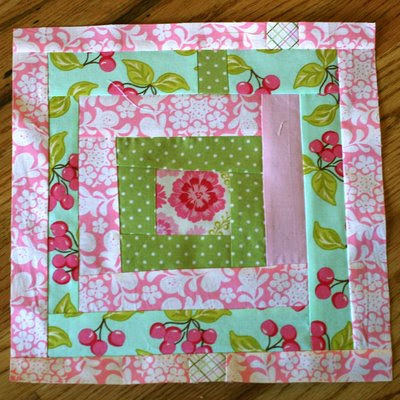 Cute blocks and lovely fabric. Lovely blocks in springly colors! such pretty blocks. i just adore the fabrics that you are using! i am in 2 quilting bees myself. it's a fun challenge. it's a great way to work with fabrics that you normally wouldn't pick. Oh, they are lovely Nettie, Darci will love them. 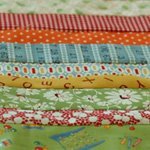 Have you got your fabric ready for March yet? I can't wait to get the next lot of fabric arrive to make some more blocks for other people. I love the blocks! I wish I could do blocks like that. I have such a hard time without a guideline. I need to loosen up maybe:) LOVE, LOVE, LOVE the fabric. I wish I could see your stash. I know that is from someone else but I still love your fabric!! :) Great job! so pretty! Love the way you put the colors together in these fun blocks! They're bee-yooo-tee-ful!! I'm thrilled that this bee has started out so well!! Would you be able to tell me what the fabric is that has the large pink flowers? It makes the center square in the bottom block and I just adore it. Must have it. I have looked at all your finished quilts and what I really like is your use of white to set off the beautiful bright colors. Very inspirational! thank you so much! i really want to try this block/quilt! I love pink and green. Such a lovely combination. Adorable! I love the bright, spring-y fabrics! Beautiful! What a great way to use up your scraps. I like the fussy cut looking center squares too.